Bruno Tonioli cooks up a storm! He’s better known for his paso doble than pesto, but Strictly Come Dancing judge Bruno Tonioli is a dab hand in the kitchen. ‘I always have people round to eat,’ he tells Woman’s Own. ‘And this was an opportunity to design cookware based on what you need. It took me two years because I’m so particular about it. ‘When I was a kid in Italy, I would hang around in the kitchen with my grandma, so it’s in my DNA. I’m not a chef – I’d never assume or pretend to be a chef, that’s a different thing. It’s because of this passion for food that Bruno was thrilled to design his own range for QVC. But the svelte dancing supremo knows how to keep his healthy appetite in check. ‘I’ve always been very food aware,’ he says. ‘And, for me, the word diet is wrong. It’s about knowing what you’re eating and always buying fresh food. 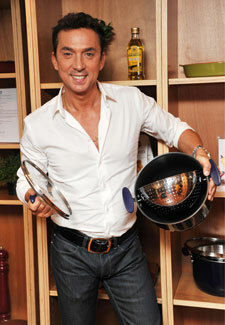 Bruno Tonioli’s new Italian inspired cookware range, Bruno’s Taste Of… is available at www.qvcuk.com. Tune in to QVC on 8 November at 1pm and 9 pm to see Bruno Tonioli himself. QVC is available on Freeview channel 16, Sky digital channel 640, Virgin TV channel 740 or Freesat channel 800.